I provided a general solution in C. My program allocates dynamically any type of matrix, with any size you want, with any length of adjacent numbers you want the program to analize (this is the only extra data you provide as a parameter of the program from the CLI). It also provides some error management (i.e. if both sizes of the grid are less than the length of the adjacent numbers you want to find the product). 2. Now the program is waiting so that the user provides a matrix to the standard input (the program accepts any size!) and press Enter. In order that the program “catches” that you are done, it is to say, that the EOF of stdin is reached, press CTRL-D (but before of this, don’t forget to press Enter, this step is important). 3. It stores the grid in a new (temporal) file. At this point the width (= the amount of numbers of each line) and the height (= the number of lines of the file) of the grid are calculated and a new grid with that right size is created. 4. All the data stored in the file is saved in the grid. 5. All the required calculations inside the grid are performed. 6. The result is printed out on the standard output and the temporal file created by the program is removed from your computer. numbers of the "grid" argument, whose size is "width"x"height", and returns the result. returns the result of doTheSuff() function. Error: the parameter must be equal or less than, at least, one side of the grid. Error: A positive integer as parameter is required. This is the requested answer. Many programming languages such as Pascal have multi-dimensional arrays support. That is, data stored in this kind of arrays can be accessed by indicating its position in the same way we would indicate the position of a point in a geometric space, it is to say, through a notation, being the number of dimensions of the space (and, analogically, the number of dimensions of the array we are working in). The point is that, despite ANSI C specification says so (section 6.5.2.1, point 3), C language doesn’t really have multi-dimensional arrays support. Instead, it uses an array-of-arrays approach; we don’t access to an array element by just separating the indices by commas, but accessing at first one array, then accessing to a second one, which is situated in a particular index, and so on until we get to the desired element of data. In this case we use the notation . In this case we have a 5×4 matrix of chararacters in which we want to retrieve the character ‘h’. In this image C defines an array of columns, a, which has five columns, a, a, a, a and a. For each column we have four rows: it is to say, each column is an array as well. For example, for the first column, a, we have the elements (rows) a, a, a and a. In particular, the character ‘h’ is allocated in the second element of the array a, it is to say, in a. You need to keep in mind the C’s approach for representing multi-dimensional arrays so that you can understand how the malloc() function works when allocating dynamically memory for multi-dimensional arrays. It allocates a block of memory (specifically size_t bytes) on the heap and it returns a pointer to the allocated memory. On error, this function returns NULL. The free() function frees the memory space pointed to by ptr, which must have been returned by a previous call to malloc(). We have lost 16 bytes (the four integer blocks we reserved through the variable number_of_elements = 4 multiplied by the size of every block of data of integer type, which is four bytes too per block). 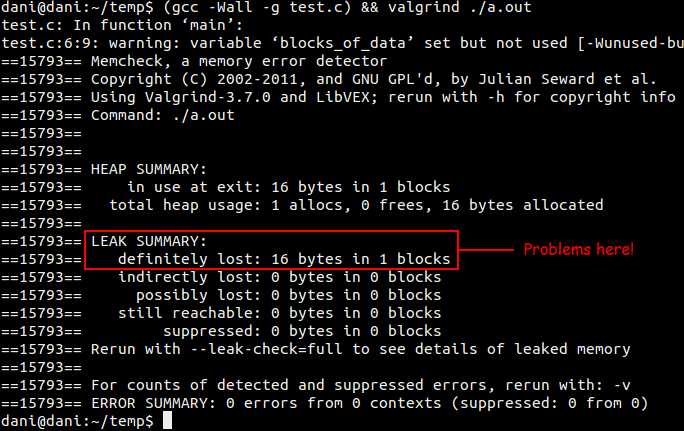 This time the memory leak was very little, only 16 bytes, but it’s really important to not forget to use the free() function for every malloc() call, specially in serious programs where there is a more significant amount of data management, because although you will recover all the memory lost after the execution-time of the program, problems may arise before, for example because of your system’s memory fragmentation. It’s at this right point where the C’s approach of multi-dimensional arrays becomes really clear. 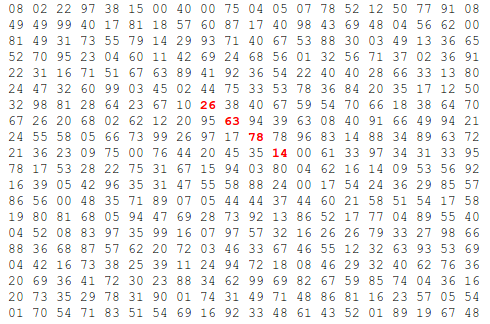 If you remember the first image of this post, the first row of that 5×4 grid was the array a. That a array of that picture is what I re-called here as grid. Look now at line 13 of the code: the malloc()‘s function usage is just the same as before, when we only had a 1D-array, but now it was obvious since we had clear that C use the concept of ‘array of arrays’. So, after we created the first row for grid, we are just going to extend each element of grid into a new array: it is to say, grid is going to be a new array (it will represent the first column of grid), grid will be a new array as well, and so on. Thus, a for-loop for calling malloc() as times as elements has grid is needed here. Once we understood the concept of array of arrays in C, it becomes obvious how the free() function should work, but be careful: the order you free the memory does matter. 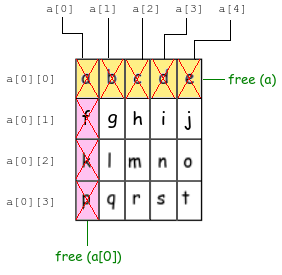 If you pay attention at the code above, we are calling free (grid) only after we have called free () for every element of grid array, and there is an important reason to do so: if you call free (grid) in the first place, you are freeing only the grid array, it is to say, you are only freeing the element a to element a. What does that mean? It means that you are only freeing the first index of each a[i] array (being i a number between 0 and 4), it is to say, you are freeing a, a, a, a and a. But this has important side effects: after you free a, you lose each pointer that references each a[i] and you can’t free them later. Therefore you will have memory leaks. * (grid + j) = * (grid + (j - 1)) + rows. You can see a practical application of this when I solve the problem 11 of Project Euler (probably in my next post), where I will allocate in a matrix any set of numbers given from the standard input. /* Returns 1 if "num" is a prime number. It took only one second to perform the summation of all prime numbers below two million! Take a moment to think about the significance of this fact. What makes this program fast is the efficiency of the algorithm that evaluates whether a number is prime. This one is a more straightforward one, because it just implements the primitive definition of prime number. But this is also an inconvenience, because it doesn’t even care about some implications of the definition. For example, the fact that if 2 is not a divisor of, let’s say, , implies that nor 4 neither 6 will be divisors of it, because they can be decomposed by a product where there is at least a . The first algorithm just skips all the composite numbers of the ones evaluated before, and that gives its efficiency. 10x times slower. No more words are needed. "I decided to have a go at this one on paper. a = m^2 - n^2, b = 2mn, c = m^2 + n^2. This implies that 2m^2 + 2mn = 1000, so m^2 + mn = m(m + n) = 500. However m > n and (m+n) > m, so the only one that would work is m = 20 and m + n = 25, giving n = 5. Substituting back into Euclid's formula gives a = 375, b = 200, c = 425, and the desired product abc = 31875000." and performing the change of variables , , (because then I could have a system of two equations with only two variables), but then I got a more complex equation with square roots and everything, so it didn't help to simplify the problem, but right the opposite. This problem can only be done by using brute force, so here we go. I provided a general solution in C. My program waits an entering number from the standard input, and then it performs the task. The user also provides as parameters the number of digits of its entering number and the N consecutive digits he/she wants the program to use (in this case it will be 5), in this right order. My first impulse was to solve it by brute force, but that was not really challenging (everyone can do a loop), so I found a more elegant way to find the solution by using some basic number theory facts. The smallest positive number that is evenly divisible by each number of a given set is just the least common multiple ( ) of all them. You read a bit more here for taking a grasp about what is this. One function to compute the gcd of a couple of integers and another one for computing the lcm of a couple of integers too. The third one will compute the lcm of an entire set of numbers (expressed in a C array), and I will use the idea expressed in a). Of course, it’s a recursive function whose base case is exactly the of two integers. I’m actually working out the problems proposed in Project Euler’s website and I thought that it could be useful for many people if I post here my solutions for some of them. I just generalized this problem by writing out a modular program, in C, that finds the largest Palindrome for any number of digits given in the command line. The program may seem larger than necessary, but that’s because I used some general functions I defined a while ago for other purposes, so they work fine with any (valid) input (so at the far end that made me easier to structure the program 🙂 ). to each digit of an integer, and returns it back. And the three-digit factors are 993 and 913, it is to say, .